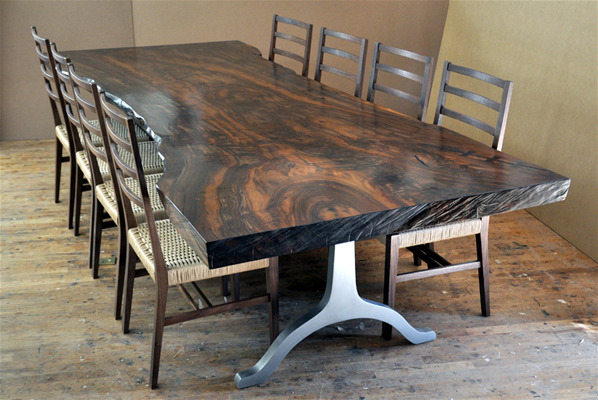 This is the latest in our series of claro walnut slab dining tables. This one is now in Montana and I am awaiting onsite photos. I hear it looks great and that the clients are very happy ... This was the thickest and most expensive slab we have ever purchased and I would have to say it was well worth the money ... It was an amazing piece of wood. the base is 1.75" thick waterjet cut plate steel and the chairs featured Danish cord seats by Sandy Sherman Chair Caning in Newfane, Vt.
the price is approximate, depending on the cost of the slab selected.